It's a good move into the space for HTC - but this needs a lot of evolution. 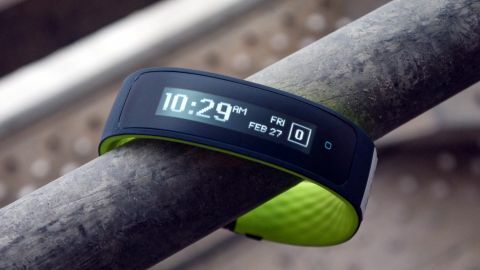 The HTC Grip is the fitness tracker that we all saw coming as soon as the brand announced a tie-in with Under Armour. However, since the apparel brand bought Endomondo, MapMyFitness and MyFitnessPal it's become a real player in the apps space, and this tracker from HTC is now a key part of that ecosystem. It's very similar to the Nike Fuelband in many ways, as it has a clasp that likes to eat arm hair when shutting, with three sizes to choose from (with a spacer to allow slight alterations). It looks the business when it comes to fitness as well, thanks to the black and lime green colours that adorn the rubbery-plastic band. It's also decked out with a screen to give you information when working out: unlike most other things on the market, it's a passive matrix OLED (which means it's very low-res, but also very good on power drain) with a 32 x 160 pixel count. In use it looks clear and bright, and you'll never have an issue seeing what's going on with your workout (or the weather/time/calendar/alarm, as the HTC Grip also does a lot of other things as well). It's a fitness tracker primarily, and works with the Under Armour Record app as the sole way of getting information to the smartphone. That said, it doesn't need to be tethered to your handset, as it packs its own accelerometer and GPS, so when you trot off into the mountains it'll be able to track you for five hours straight before the battery gives out. With that in mind, this is both a fitness tracker and running watch beater, with a US$199 (about £129, AU$255) price tag. That seems a little expensive, and given HTC doesn't have a huge presence in this space could be a hard sell, but it does have good build quality and more than a little functionality. It's IP57 rated, which essentially means you can take it into the shower but not go swimming with it. It will also show smart notifications from your phone, or let you control tunes when working out should you decide that to head into the mountains with no way of communicating is a BAD IDEA. The interface on the unit I tested was very hard to use, requiring swipes that glide over the flush interface or pressing the home button that is also smooth and non-tactile - but this was a very, very early build so it's completely unfair to judge it too much now. The annoying thing to some is that the HTC Grip doesn't have a heart rate monitor, which means you'll need to buy a separate chest strap that's Bluetooth LE / 4.0 compatible. This does mean it's more accurate (HTC is apparently aiming this at the more elite athlete anyway) but does add a lot to the cost - around $80 for a decent one. This is a very early verdict, as it's more based on the build quality and spec sheet than anything else. It's hard to see who buys this device right now - the new runner might stop at the higher price, and the more seasoned road warrior will want a lot more functionality - although it does look decent as a watch. If only the display stayed on permanently, it would be a lot easier to recommend. The addition of GPS is great, and there's the seed of a great idea here... it just needs a couple of iterations down the line, a little more influence from Under Armour perhaps, and it could be a very good accessory for your smartphone.